We normally don't cover track pack releases for music games on here, mostly because they come too frequently and in too small of chunks. 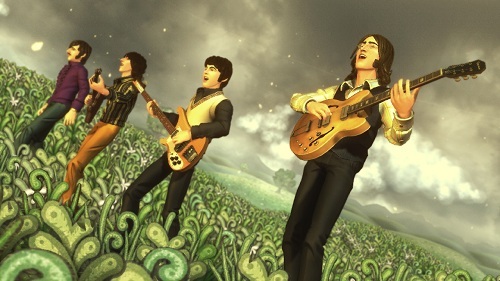 We're going to make an exception though for The Beatles, because, well they ARE The Beatles and because it's not your ordinary track pack. The Abbey Road track pack, named from their album of the same name, not only has the rest of the tracks missing from The Beatles Rock Band - but also includes the 16 minute B-Side medley of "You Never Give Me Your Money," "Sun King," "Mean Mr. Mustard," "Polythene Pam," "She Came in Through the Bathroom Window," "Golden Slumbers," "Carry That Weight" and "The End." The other unique thing about the pack is that there are new character animations and dreamscapes to play in that are inspired by the songs. Finally you have three song medleys includes for a few other tracks on the album. How much is all of that? It comes out to $16.99, no small price indeed. Thankfully you can pick and choose the singles out if you want. The track pack is out now for the Xbox 360 and Wii, and will be out Thursday for the PS3. Page created in 0.5576 seconds.